Ceiling-Mounted Small Animal Anesthesia Machine: VT-110-HCD - JD Medical Dist. Co., Inc.
One of the major issues facing veterinarians today is the clutter and tripping hazards present in operating rooms caused by the increasing amount of equipment and the cables and hoses they require. This issue was presented to JD Medical and since JD Medical is always innovating, we invented a unique solution to the problem. We have a reputation in the medical field for doing the impossible and making visions of the future a reality. One such vision is our newest product, the VT-110-HCD ceiling mounted small animal anesthesia machine. This anesthesia machine system is the first and only anesthesia machine of its kind. JD Medical came up with the concept in order to provide an anesthesia delivery system that was out of the way of the operating area but was easy to access, easy to move, and supremely ergonomic. Enter the VT-110-HCD ceiling mounted small animal anesthesia machine. The VT-110-HCD is more than just an anesthesia machine. The JD Medical VT-110-HCD is an anesthesia delivery system that represents the ultimate in quality, reliability, functionality, and accessibility, not to mention aesthetics. The anesthesia machine portion of the system is very similar to the JD Medical VT-110 Small Animal Anesthesia machine which has served the veterinary field for over 25 years. The VT-110 Has a reputation for extreme quality and reliability. In addition, it is the smallest and lightest complete circle-system anesthesia machine on the market. It is loved by veterinarians and technicians because it is so simple and easy to use with the color-coordinated connections, quick-release sodalime canister latches, and expanded range flowmeter for extreme accuracy, just to name a few reasons. It is manufactured completely in the USA by JD Medical in Phoenix, AZ and is made from the highest-quality components available. The VT-110 Small Animal Anesthesia Machine is integrated with a very reliable and compact fully-articulating hydraulic arm. This means that the arm supports all of the weight of the anesthesia machine and vaporizer and allows the operator to move and lift the anesthesia machine around in every direction with ease but the strength of the arm will not allow it to fall or sag while suspended. 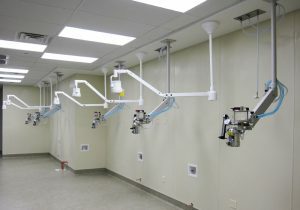 The anesthesia machine is no longer on the floor taking up valuable space around the operating room and cluttering the floor with hoses and lines that are dangerous tripping hazards. JD Medical is the first company to completely eliminate operating room clutter and we have done so in a very innovative way.